NEW YORK / TORONTO (November 22, 2010) – The National Hockey League (NHL®) and the National Hockey League Players’ Association (NHLPA) raised and donated more than $1.1 million to cancer organizations during Hockey Fights Cancer Awareness Month in October. With support from the entire hockey community, including all 30 NHL clubs, NHL players, management and fans, the $1.1 million raised and donated eclipsed last year’s total, bringing the sum raised for cancer organizations to a total $12 million in Hockey Fights Cancer’s 13-year history. 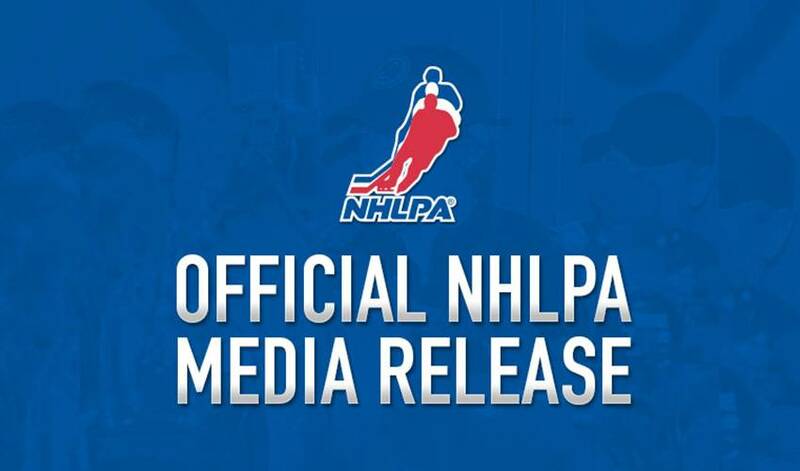 The NHL and the NHLPA launched the month-long initiative with $475,000 distributed in grants to The Leukemia & Lymphoma Society, Prostate Cancer Canada, ZERO - The Project to End Prostate Cancer, the Pancreatic Cancer Action Network and local cancer charities in all 30 NHL markets. · NHL.com and NHLPA.com auctions of signed commemorative Hockey Fights Cancer apparel and products raised almost $25,000 for the initiative, a 31 percent increase from last year’s efforts. · Items auctioned included Best of the Decade: Reflections of Hockey's Past Ten Years books signed by NHL team captains, Reebok Hockey Fights Cancer caps and team jerseys worn by some of the top NHL players in the League during the 2010 NHL Player Media Tour in September. · More than 400,000 fans attended Hockey Fights Cancer Awareness Nights organized and hosted by NHL clubs. The Hockey Fights Cancer Awareness Nights raised funds or awareness for local cancer organizations. · More than 13 million viewers tuned in to national and local telecasts of games featuring teams taking part in Hockey Fights Cancer Awareness Nights. Each year, the hockey community shows its support for Hockey Fights Cancer by wearing one-of-a-kind apparel. Lavender, which represents awareness for all cancers, returned as the designated color for this year’s initiative. NHL coaches, broadcasters and team personnel wore lavender commemorative Hockey Fights Cancer ties during all Hockey Fights Cancer Awareness Nights games in October. This year, some of hockey’s high-profile fans joined in the effort to promote awareness for this important cause by wearing Hockey Fights Cancer commemorative apparel, generating more than $2 million of positive media exposure. · “Meet the Press” moderator and Washington Capitals season ticket holder David Gregory proudly wore the commemorative tie during an edition of the Sunday morning news program. · “Dancing with the Stars” contestant Bristol Palin wore her Hockey Fights Cancer Reebok ladies track jacket during televised rehearsals for the hit show. · Buffalo Sabres goalie Ryan Miller photographed fellow NHLers Patrice Bergeron of the Boston Bruins, Mike Cammalleri of the Montreal Canadiens, Drew Doughty of the Los Angeles Kings, Henrik Lundqvist of the New York Rangers and Steven Stamkos of the Tampa Bay Lightning wearing Hockey Fights Cancer ties for an exclusive portfolio and feature for VanityFair.com. · Chris Berman wore his Hockey Fights Cancer tie during a broadcast of ESPN Sunday NFL Countdown. · E!’s Chief News Correspondent Ken Baker and Time magazine writer Joel Stein showed their support for the initiative by wearing their Hockey Fights Cancer ties during TV interviews and online segments. Hockey Fights Cancer’s first foray into digital and social media platforms was successful, generating more than $50,000 in funds, including donations made via text message to benefit the U.S. and Canadian chapters of The Leukemia & Lymphoma Society, and generating fan support on Twitter (@NHL) and NHL on Facebook (facebook.com/NHL). · The Los Angeles Kings and Colorado Avalanche fans faced off on Twitter during the first-ever NHL Hashtag Battle to benefit Hockey Fights Cancer. All tweets featuring the #GoAvs and/or #GoKings hashtags during the Oct. 23 game raised $1 for that team’s cancer-related charity of choice. At the conclusion of the game, the hashtag battle netted more than $43,000 for the Childrens Hospital Los Angeles and Kroenke Sports Charities. During the hashtag battle, GoKings was the top trending topic on Twitter in world. Hockey Fights Cancer™ is a joint charitable initiative founded in December 1998 by the National Hockey League and National Hockey League Players’ Association. It is supported by players, NHL member clubs, NHL alumni, the NHL Officials’ Association, professional hockey athletic trainers and equipment managers, corporate marketing partners, broadcast partners and fans throughout North America. The goal of Hockey Fights Cancer™ is to raise money and awareness for national and local organizations involved in cancer care and research. To date, Hockey Fights Cancer™ has raised more than $12 million. Hockey Fights Cancer™ is a component of The Biggest Assist Happens Off The Ice®, the National Hockey League’s® and National Hockey League Players’ Association’s social responsibility program that builds on hockey’s long-standing tradition of addressing important social issues in North America and around the world.